Markings: (Verso) lining, stamped with Ploos van Amstel's embossed collector's mark;(verso) lining paper, has watermark distinguished by the Strasbourg lily. Secondary Inscription: (Recto) in the lower right corner, inscribed in brown ink, "14"; (Verso) in the lower left lining, inscribed in brown ink, "Petrus Paul: Rubbens. f/gebooren. te Keulen 1577. obit 1640/Deze Teekening 1574. 21 Octobr,...verkogt in Amsterdam/ de kunstryke verzameling van den heere Jeronimus Tonneman/voor de Zomma van Vierhondert Een en Sestig guldens./Zie de catalogue 21 Octob 1754. Pag 24. Letter D. No. 1./'t Schildery van deeze Teekening door P:P:Rubbens./hangt in de keurvorstelyke gallery/te Dusseldorp. "; inscribed in an another hand, in brown ink, "ao a"; inscribed in pencil, "Sl.JJS.SOS-WOOO"; (verso) of lining, below two pasted catalogue entries, inscribed in erased pencil, several lines of illegible writing. 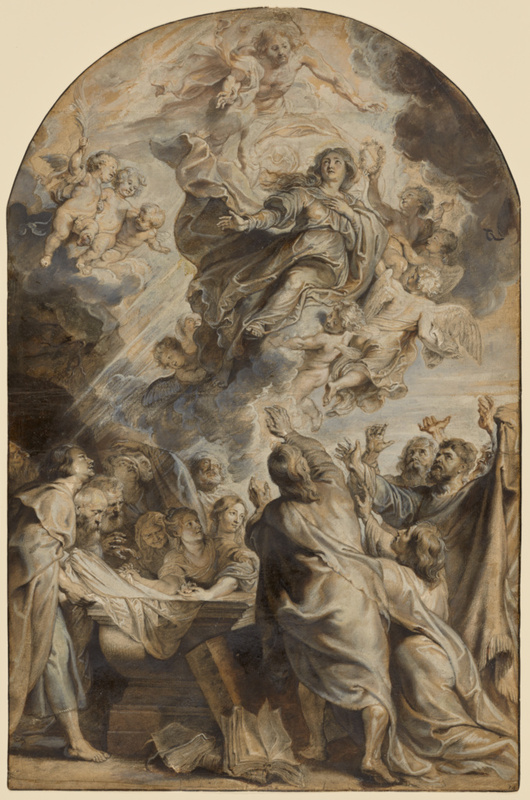 When Peter Paul Rubens decided to have an engraving made after his 1618 altarpiece of the Assumption of the Virgin, a young member of his studio, Paulus Pontius, made a detailed drawing of the painting in black chalk. Scholars believe that little evidence of Pontius's design remains. Rubens extensively reworked the drawing, probably in an effort to instruct Pontius on how to make good engravings after his paintings, an activity that Rubens considered very important. The young Pontius went on to become one of the most successful interpreters of Rubens's work through engravings.